NEW YORK (Reuters) – A U.S. judge in New York on Wednesday ruled that President Donald Trump may not legally block Twitter users from his account on the social media platform based on their political views. Trump has made his @RealDonaldTrump Twitter account an integral and controversial part of his presidency, using it to promote his agenda, announce policy and attack critics. He has blocked many critics from his account, which prevents them from directly responding to his tweets. U.S. District Judge Naomi Reice Buchwald in Manhattan ruled that comments on the president’s account, and those of other government officials, were public forums, and that blocking Twitter users for their views violated their right to free speech under the First Amendment of Constitution. 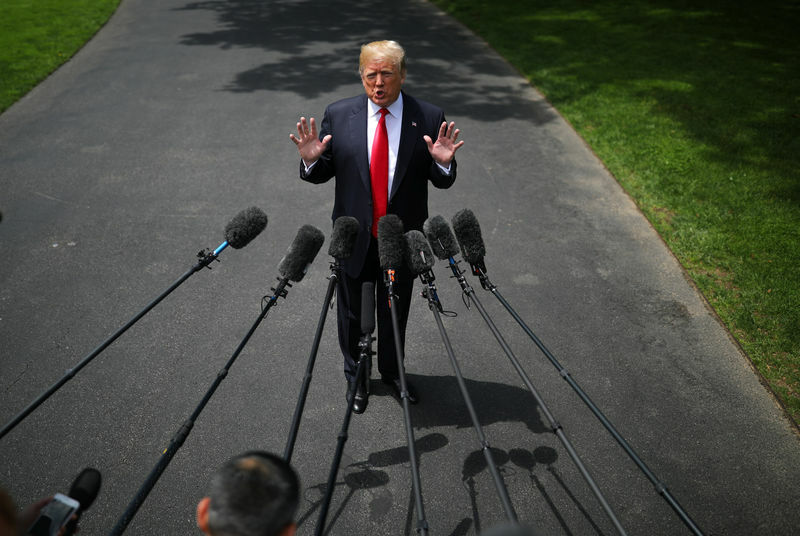 Eugene Volokh, a University of California Los Angeles School of Law professor who specializes in First Amendment issues, said the decision’s effect would reach beyond Trump. “It would end up applying to a wide range of government officials throughout the country,” he said. Twitter Inc (N:TWTR), which is not a party to the lawsuit, declined to comment on the ruling. Buchwald’s ruling was in response to a First Amendment lawsuit filed against Trump in July by the Knight First Amendment Institute at Columbia University and several Twitter users. The individual plaintiffs in the lawsuit include Philip Cohen, a sociology professor at the University of Maryland; Holly Figueroa, described in the complaint as a political organizer and songwriter in Washington state; and Brandon Neely, a Texas police officer. Cohen, who was blocked from Trump’s account last June after posting an image of the president with words “Corrupt Incompetent Authoritarian,” said he was “delighted” with Wednesday’s decision. “This increases my faith in the system a little,” he said. Novelists Stephen King and Anne Rice, comedian Rosie O’Donnell, model Chrissy Teigen, actress Marina Sirtis and the military veterans political action committee VoteVets.org are among the others who have said on Twitter that Trump blocked them. Buchwald rejected the argument by Justice Department lawyers that Trump’s own First Amendment rights allowed him to block people with whom he did not wish to interact. She said Trump could “mute” users, meaning he would not see their tweets while they could still respond to his, without violating their free speech rights. Duke University constitutional law professor Stuart Benjamin said he disagreed with Buchwald’s finding that parts of Trump and other officials’ Twitter accounts were public forums. He said he thought such a designation would require a more explicit statement to that effect by the government. “If Donald Trump is giving a speech to 100 hand-picked people, and one of them heckles him, he gets to throw that person out,” said Benjamin, adding that he thought the president had a strong chance of winning an appeal of Buchwald’s decision. Buchwald stopped short of ordering Trump to unblock users. Trump had argued that the court did not have the power to issue a direct order against the president. The judge said she disagreed, but that there was no need to get into a “legal thicket” over the issue because she assumed Trump or his social media director Dan Scavino, who also was a defendant in the case, would unblock the users in light of her decision. Cohen said Trump had not yet unblocked him as of late Wednesday afternoon. “Personally, I’m skeptical that he will take that step without more legal pressure,” he said.